How long does your average brew day take? If brewing your own beer is the next logical step for many people after realizing that they love drinking beer, then growing your own ingredients in the next step for many people after they learn that they love brewing. That's where The Homebrewer's Garden comes in. I think the idea of growing hops at home has been really boosted by the hop shortage (which makes growing hops seem like a real cost saver) and the popularity of fresh hopped ales (something that is only possible if you have a very local source for hops). Growing grains and herbs for brewing doesn't have the same popularity, but there are some homebrewers out there doing it. Content: The book is divided into three main sections covering the growing, processing, and use of hops, herbs, and grains. Hops: This is the section I think most homebrews will be interested in. The chapter does a good enough job covering the subject that someone who doesn't have any/much experience gardening can do a pretty good job. 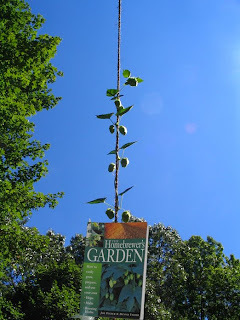 It starts with simple topics like what type of hops to choose, where to plant them, and how to plant them. It then moves onto more complex topics like soil pH adjustment and trellis design. There are plenty of good drawing when it comes to something like trellis design that are very helpful. The book was written more than 10 years ago so it may be a bit lacking on some of the newer varieties of hops. That said I think most people start out growing something classic like cascades before moving on to sterling or sunbeam (plus whoever you are buying the rhizome from should be able to give you some basic information). The next sections is on identifying pests, diseases, and nutritional deficiencies and how to treat them if they occur. Most of the treatment options are do-it-yourself organic (using soap to deal with insects for example), I would have at least liked to hear briefly about the commercial organic options. Using the advice from this book I have two pretty strong healthy hop plants they don't get much yield but I blame that on the medium sun stop where I planted them (against the suggestions of this book). The end of the chapter covers the harvest and post-harvest treatment of the plants and hops (drying and storage). There are instructions for building an oast, but I've had pretty good luck with my small harvests just laying them out on screens or using the microwave. Herbs: The instructions for growing herbs are much more general than the chapter on hops because there are so many types of herbs used in brewing. It starts with general directions for starting the plants from seeds, divisions (that is dividing an already growing plant), root cuttings, hardwood cuttings, and offshoots. It then gives some basic tips for caring for, harvesting, drying, and storage that can be applied to most herbs. Next is a section where about 40 herbs are featured with a page featuring information on what growing conditions it prefers, approximate usage rate, and any other relevant growing information. This section is more what Sacred Herbal and Healing Beers should have looked like. This section is helpful in couple ways. If you are thinking of growing herbs for brewing this is a great reference, but even if you aren't interested in growing the herbs yourself the suggestions could be put to use when using bought/gathered herbs. Many of the herbs also have culinary applications, so if you want to grow your own sage/basil/chamomile this wouldn't be a bad book to have. Grains: Barley is covered first in great detail. The instructions cover everything from soil preparation, through planting, care, harvest, threshing, malting, and kilning. The more complicated and difficult part seems to be the malting and kilning. The process is explained in enough detail that it seems doable on a small scale, but I haven't tried it so I can't vouch for how complete/accurate the instructions are. Next comes a section on the various other grains that can be grown and used in beer. I was surprised to learn that it can be dangerous to malt rye or oats at home due to the possibility of poisonous butryfying bacteria, so the author advises against trying it. Some of the grains covered include corn, sorghum, and wheat. For each grain there is a list of some of the available varieties, each one has a short paragraph of basic information along with the days to maturity. Even if you aren't willing (or don't have the space) to grow your own grain you might consider making some crystal or toasted malt from store bought pale malt. I have made some toasted malt before, but I have never tried producing crystal malt. Playing with your malt seems like a pretty easy way to give your beers a unique house character that no one else will have exactly. I'd suggest making batches big enough that you can save some and adjust your usage based on your first try using it. Recipes: The recipes themselves are all geared towards using the homegrown ingredients discussed in the rest of the books. Some of the recipes sound like tasty ideas (Honey Basil Wheat and Spruce Ale), while others sound pretty out there (Quinoa Bitter and Rhubarb Ale). I haven't brewed any of the recipes as is, but most of them look solid to my eye and there are certainly some interesting ideas in there (especially considering that it was published long before Radical Brewing and other "interesting" homebrew books). The recipes are mostly given as extract plus steeping grains, but each has an all-grain equivalent listed as well. Clearly some of the recipes were all-grain originally and couldn't be easily changed to a steeping grain version (one recipe calls for 1/2 lb of quinoa in the extract recipe and 6 lbs in the all-grain). In general there is a lot of steeping of grains that need their starch converted (toasted malt, oats, rye etc...), so if you are an extract brewer watch out for that. Accuracy: I don't have any major issues with the accuracy of this book. That said, I am not even close to a competent gardener, so I cannot be as exacting as I normally am in my critique. That said, some of the amounts for the herbs seem a bit high (and the ranges are very broad in general). The rosemary in particular seems very high (1.5 oz) after trying just a few grams in a flavorful 11 gallon batch and getting enough resiny flavor for my taste. Readability: It is a well designed book, and the reading is pretty easy. Really it is more of a reference book, something you can grab when your hop leaves look a little yellow, or to find out how much dandelion you might want to use in a spring saison you are planning. Overall: I think this is a very worthwhile book if you are planning to grow hops, and might even be worth it if you just want to play with making your own toasted/crystal malts or adding herbs. I certainly will be referencing this book often for the 20 rhizomes I recently planted with a few friends at a local community garden. If you can't come up with the $10.17 to buy this book, and all you want to do is grow some hops here is a free hop growing manual by Rebecca Kneen. ah, the brewer's garden...a wonderful intersection of two my keen interests. For those interested in taking the next steps towards that truly homebrewed beer, I have found a mailorder source for 2 row barley (wheat, oats, etc. too) seeds...organic, too. and check out the March 24th basic brewing video of a homebrewer's (Chris Colby, from BYO mag) barley field + containerized hop growing.